Written by protecttheadirondacks on October 1, 2018 . Posted in Latest News. See formal public comments in oppositionto this new bridge. The August 22, 2018 Environmental Notice Bulletin provided public notice about plans by the Department of Environmental Conservation (DEC) to build a new 139-foot-long, 12-foot-wide, steel-truss bridge for public motor vehicle use over the Cedar River where it is designated as a Scenic River under the New York State Wild, Scenic and Recreational Rivers Act (â€œRivers Actâ€). The DEC is seeking to award itself a permit to build this bridge and a variance from Rivers Act regulations regarding trail widths and materials for bridge construction. Under any rational standard, it should be obvious that the DEC has failed to adequately consider alternatives that plainly exist, and are already in use, and that its proposal clearly inflicts an undue adverse impact upon the natural resources of the Cedar River that the Rivers Act requires the DEC to uphold. An important part of this application that appears to be omitted is the fact that there is already a snowmobile trail bridge over the Cedar River that connects the towns of Indian Lake, Newcomb and Minerva. DECâ€™s application for a permit and variance should be denied. Map above show the location of a new bridge proposed to be built over the Cedar River. This is a duplicative bridge as there is an existing bridge on the Cedar River upstream of the current location. A perfectly viable, functional and enjoyable snowmobile trail system already links Indian Lake to Newcomb. In July, the APA approved construction, which has begun, of a new snowmobile trail from Newcomb to Minerva. Thus, Indian Lake and Minerva are already connected, making a new trail system from Indian Lake to Minerva redundant and unnecessary. This map shows DEC’s favored alternative that seeks to build a new snowmobile trail through the Vanderwhacker Mountain Wild Forest area. Note that unlike the map above, the DEC does not show the existing Indian Lake to Newcomb snowmobile trail, which connects to Minerva. This is a new high for disingenuousness by the DEC.
(b) Scenic rivers are generally free of diversions or impoundments with limited road access. Their river areas are essentially primitive and undeveloped or are used for agriculture, forest management and other dispersed human activities which do not in themselves substantially constrain public use and enjoyment of these rivers and their environs. Management of scenic river areas will be directed to preserving and restoring their natural scenic qualities. Additionally, the proposed bridge is entirely a self-created hardship. First, bridge is entirely unnecessary as there is already a snowmobile bridge on the Cedar River about ten miles upstream in an area where the river is classified as Recreational. This bridge facilitates a snowmobile trail that connects the Town of Indian Lake snowmobile trails to the Town of Newcomb snowmobile trails. From the Town of Newcomb snowmobile trail network the Town of Minerva is connected. The existing snowmobile trail and bridge that connects Indian Lake-Newcomb-Minerva includes trails in the Blue Mountain Wild Forest Area, Vanderwhacker Mountain Wild Forest Area, and conservation easement lands where State of New York expressly purchased public snowmobile trail rights. The trail that connects Indian Lake and Newcomb has been in existence for nearly 20 years and is fully operational. The trail that connects Newcomb to Minerva is under construction. The new trail that requires a second bridge over the Cedar River is plainly redundant. Moreover, this redundant trail requires cutting over five miles of new trail 12-foot wide trail, in part through old growth forest areas on the east side of the Hudson River in the Vanderwhacker Mountain Wild Forest, that will necessitate the destruction of upwards of 1,000 trees 1 inch diameter and greater per mile. The proposed Cedar River bridge is part of a redundant, duplicative and unnecessary trail that violates the Snowmobile Trail Maintenance guidelines prohibiting redundant trails. There is simply no rational way that the â€œhardshipâ€ criteria above can be interpreted in any way other than self inflicted. As such the variance request must be denied. The DEC proposal for a new bridge over the Cedar River fails to pass muster with the criteria for evaluating a variance under the River Act regulations. Actions proposed to be undertaken by state agencies are designed to preserve, protect or enhance the resources and values of designated rivers. An impartial reading of these four criteria finds that DECâ€™s proposal to build a redundant and duplicative 139-foot-long, 12-foot-wide steel bridge over the Cedar River fails to pass muster by any rational standard. The proposed application for a permit/variance to construct a motor vehicle bridge over an area of the Cedar River classified as Scenic violates DEC criteria for a number of reasons. Reasonable Alternative Exists:As stated above, there is already a snowmobile bridge over the Cedar River that is part of a fully operational snowmobile trail system that connects the Towns of Indian Lake, Newcomb and Minerva. Because of this, a new bridge over the Cedar River is redundant and unnecessary. The existing trail system is perfectly adequate for snowmobile riders to travel from Indian Lake to Newcomb to Minerva. Undue Adverse Impact:The construction of a second, duplicative and unnecessary bridge, by definition causes an undue adverse impact. This bridge is simply not necessary. Â§ 15-2709 (2). Administration of the system. expressly authorized in paragraphs b and c of this subdivision. standards duly promulgated by regulations. The new bridge should be denied because its part of a trail system that openly violates the Rivers Act. The DECâ€™s proposal to construct a new 139-foot bridge redundant bridge over the Cedar River where it is classified as a Scenic River is a serious violation of the Rivers Act regulations at 6 NYCRR Part 666. DECâ€™s proposal violates the Rivers Act because DEC Regulations at 6 NYCRR Part 666.3 Definitions states that a â€œtrailâ€ â€œmeans a marked and maintained path or way four feet or less in width, and located and designed to provide for reasonable access in a manner causing the least effect on the local environment.â€ The DEC proposes to build a class II community connector trail 12-feet in width clearly conflicts with the Rivers Act regulations. The DEC is seeking a permit and variance to build a bridge 300% bigger than existing regulations allow. This stretches credulity. The draft Environmental Impact Statement (EIS) that DEC utilized at the time of adoption of the Part 666 regulations provides even more insights to the prohibition of motor vehicles in Scenic River areas. In responding to a comment on its draft EIS on adopting Part 666 DEC stated on page 58 â€œThe Department agrees that motorized recreational vehicles should not be allowed to operate in scenic river areas due to their relatively undeveloped nature and the concurrent extensive low intensity recreational and other passive outdoor uses which predominately [sic] take place within such river areas and conflict with motorized recreational vehicles.â€ The response goes on to state such use is acceptable in recreational river areas. It is clear that motor vehicle bridges in classified Scenic River areas violate the Rivers Act and DEC Rivers Act regulations. The new proposed bridge fails to conform with the Rivers Act regulations. 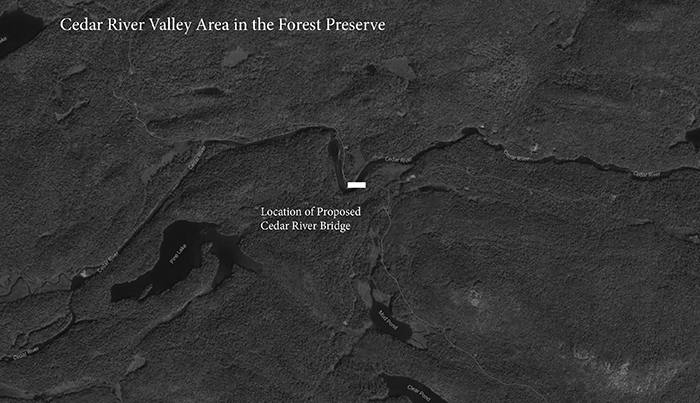 The proposed Class II Community Connector snowmobile trail bridge over the Cedar River violates the Rivers Act and Rivers Act regulations. The DEC and APA have historically taken the position that Scenic river corridors â€œbe managed in accordance with the guidelines and criteria for lands classified as Wild Forest. In Wild Forest areas, snowmobile trails with bridges are allowedâ€ (APA staff memo on Vanderwhacker Mountain Wild Forest UMP Amendment, July 2015). This narrow reading of the State Land Master Plan regulations stands in direct conflict with DECâ€™s regulations with regard to allowable uses in Scenic River corridors. Just as the APA Act directs the APA to promulgate regulations for State lands through the Adirondack Park State Land Master Plan, the Environmental Conservation Law directs the DEC to develop regulations for the Rivers Act. DEC Rivers Act Regulations at 6 NYCRR Part 666.4 states â€œManagement of scenic river areas will be directed to preserving and restoring their natural scenic qualities.â€ PROTECT does not see how construction of a Cedar River Bridge meets the requirement to preserve and restore â€œtheir natural scenic qualitiesâ€ of a Scenic river. Â§ 15-2721. Conflict with other laws. Any section of the state wild, scenic and recreational rivers system that is or shall become a part of the Forest Preserve, the Adirondack or Catskill Parks or any other state park, wildlife refuge, or similar area shall be subject to the provisions of this title, and the laws and constitutional pro- visions under which the other areas may be administered, and in the case of conflict between the provisions of those laws and constitutional provisions and the provisions of this title, the more restrictive provisions shall apply. DECâ€™s proposal violates the Rivers Act because DEC Regulations at 6 NYCRR Part 666.3 Definitions states that a â€œtrailâ€ â€œmeans a marked and maintained path or way four feet or less in width, and located and designed to provide for reasonable access in a manner causing the least effect on the local environment.â€ The DEC proposes to build a class II community connector trail 12-feet in width clearly conflicts with the Rivers Act regulations. In situations of such conflict, the Rivers Act, as quoted above, requires that the more restrictive requirement should prevail, which in this case would be 4 feet versus 12-feet. PROTECT is at a loss to understand how the DEC can propose a trail more than 300% wider than what is currently allowable under DECâ€™s own regulations in 6 NYCRR Part 666 and comply with the â€œmore restrictiveâ€ requirement of the WSRRA. The DEC proposal for a new 139-foot long, 12-foot wide bridge references the â€œSnowmobile Trail Guidanceâ€ developed by the Adirondack Park Agency and DEC. The 12-foot wide trail standard is a Guidance adage. The Guidance recognizes the major financial investment to build and maintain snowmobile trails in the Forest Preserve as well as the negative ecological impacts of these major trail systems on natural resources. In light of these considerations, the â€œGuidanceâ€ states clearly that trail duplication and redundancy is prohibited and that trails should not be built in wild, interior areas. The DEC somehow references the Snowmobile Trail Guidance to support the 12-foot width of the bridge but omits any discussion whatsoever of the Guidance directive against trail redundancy. Snowmobile trails or trail segments that serve to connect communities and provide the main travel routes for snowmobiles within a unit are Community Connector Trails. These trails are located in the periphery of Wild Forest or other Forest Preserve areas. They are always located as close as possible to motorized travel corridors, given safety, terrain and environmental constraints, and only rarely are any segments of them located further than one mile away from the nearest of these corridors. They are not duplicated or paralleled by other snowmobile trails. Some can be short, linking communities to longer Class II trails that connect two or more other communities. The new trail that connects to the new bridge over the Cedar River is duplicative. There is already a snowmobile trail â€“- with a bridge over the Cedar River â€“ that connects the Town of Indian Lake to Newcomb and Minerva. Second, under Snowmobile Trail Siting Standards, the Guidance states â€œNew and rerouted snowmobile trails, through the acquisition of easements or other access rights from willing sellers, will be sited on private lands rather than State lands wherever possible to minimize impacts on the Forest Preserve.â€ The existing trail that connects Indian Lake to Newcomb and Minerva utilizes conservation easements, as directed by the Guidance. The redundant trail that requires a new bridge over the Cedar River will be built entirely on the Forest Preserve. This is an express violation of the Guidance. Third, the Guidance goes on to say â€œNew and rerouted snowmobile trails will be sited, when possible, along existing routes or previously existing old routes such as foot trails, roads, utility rights of way and abandoned railroad beds in lieu of constructing entirely new trails.â€ The trail that requires a new bridge over the Cedar River also requires cutting miles of new class II trail through the Vanderwhacker Mountain Wild Forest area to connect it to Newcomb and Minerva. The redundant trail that requires extensive new trail cutting. This is an express violation of the Guidance. Fourth, the new class II community connector trail that requires a new bridge over the Cedar River also runs through a deep interior area of the Vanderwhacker Mountain Wild Forest. DECâ€™s plans to retain and utilize the Polaris bridge and build new class II community connector snowmobile trail through the interior of the Vanderwhacker Mountain Wild Forest area violates the Guidance because will be cut through a wild, interior area of the Forest Preserve. The western section of the Vanderwhacker Mountain Wild Forest has long been a trailless and wild part of the Forest Preserve and should remain so. The creation of this trail, which is directly connected to the proposed bridge over the Cedar River, expressly violates the Guidance. Fifth, the Guidance directs trail construction away from fragile natural resources, such as rivers. Under Snowmobile Trail Siting Standards the Guidance states: New and rerouted snowmobile trails will be sited with an objective to avoid locations that present safety hazards such as the edges of ravines or ledges, major highway crossings and crossings of frozen surfaces of water bodies such as rivers, lakes and ponds. If suitable alternative routes are designated or developed, trails that lead riders to unsafe locations will be closed to snowmobile use in favor of the alternative routes in order to lower risks and eliminate unnecessary snowmobile trail mileage. For all of the reasons stated above it is clear that the newly proposed bridge over the Cedar River is part of an unnecessary and redundant class II snowmobile that widely violates the Snowmobile Trail Guidance. The Guidance references the 2006 Snowmobile Plan for the Adirondack Park. The proposed actions to build a new Indian Lake-to-Minerva snowmobile trail that requires a new bridge over the Cedar River is contrary to the priorities detailed in the snowmobile plan. This plan contained a list of priority trail systems to link communities throughout the Adirondack Park. This plan is the definitive policy to date of vital community connection trails in the Adirondacks. Under â€œCommunity Connection Goalsâ€ in the â€œTrail Sectionâ€ part of the Snowmobile Plan (pages 45-46), there is no mention of a Minerva-to-Indian Lake snowmobile trail. This was not a major goal for New York and was not recognized as a high priority. The Environmental Impact Study associated with the Snowmobile Plan did not evaluate the impacts of a Minerva-to-Indian Lake trail. PROTECT believes that in order for the APA-DEC to approve and build a Minerva-to-Indian Lake trail, the State must revise the 2006 Snowmobile Plan for the Adirondack Park. For all the reasons stated above the proposed new bridge over the Cedar River fails to conform with the NYS Wild, Scenic and Recreational Rivers Act, violates Rivers Act regulations, violates the Snowmobile Trail Siting Guidance, and fails to comply with the NYS Snowmobile Plan for the Adirondacks. For all of theses reasons, a permit and variance for this unnecessary and redundant bridge that will cause irreparable undue adverse impacts and degrade the scenic qualities and natural resources of the Cedar River and Forest Preserve should be rejected.